This is our pup Tess, pictured at 9 weeks old. She's now 10 months. Tess is our first Berner, but not last, as we're looking into getting a male pup to keep her company. 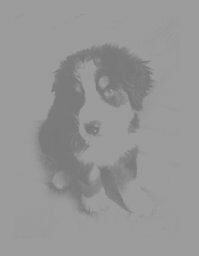 Bernese Mountain Dogs (formerly called Durrbachler) are part of the Swiss Mountain Dog Group, of which there are seven breeds. They are classed as working dogs, used as herders and cart-pullers historically. Berners are also classed as a giant breed. Full grown weight is between 80 and 120 lbs. The female is typically smaller than the male. They have an even temperament, gentle with children, but make poor guard dogs. Because of their heavy coat, they dislike the modern central heating of indoors, preferring to be outdoors or will lie against a wall to cool down. The only real drawback to owning a Berner is their life-span, which is anything from 7-10 years. A Breeder once told me, on the life of a berner; "3 years a puppy, 3 years an adult, 3 years a pensioner - anything more is a blessing". Unlike Labrador Retrievers, Berners are not 'chewers', but they have been known to eat holes in walls out of boredom! They are also quite fussy eaters, which means the Berner owner really must be strict, or else one will be replacing their brand of food often. Bernese are still quite rare (when compared to Labrador Retrievers) in Scotland, with the main breeders concentrated in and around Central Scotland. 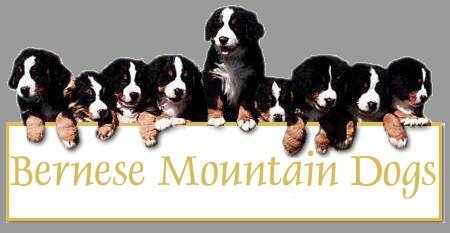 The Bernese Mountain Dog Club of Scotland is dedicated to the advancement of knowledge of the breed, with most owners as members. We have visited the Skeds several times, and are most helpful with any questions on the breed, being judges in the show ring. Margaret Sutherland is a breeder and runs the Bernese Mountain Dog Club of Scotland. Kate McDuff is the breeder from whom we got Tess. Note: This list is by no means comprehensive. I have only listed the breeders that I know in person or by reputation. Should any breeder/expert/judge read this and would like to be added to this list, please e-mail me.